When David Crosby (CSNY) first heard Wammie™ Award winner Carey Colvin, he said, “Definitely give up your day job!" With a strong passion for music, she has been described as a songwriter with an intelligent approach to her lyrics. Carey’s debut CD, The Distance Wall, was released in 2000 and won the Wammie™ Award for Debut Recording of the Year. She has been a featured performer on stages including Writer's Night at The Bluebird Cafe, The Birchmere opening for CPR (Crosby, Pevar, and Raymond), the Cellar Door Stage opening for Styx and Pat Benatar at Jiffy Lube Live Pavilion, the Gibson Showroom at The Hit Factory (taped for Good Morning America), and The Kennedy Center. She’s been a Featured Artist on radio stations from Washington, DC to California to Arkansas to Belgium to Alaska, to National Public Radio’s Car Talk. Carey is the daughter of an Air Force fighter pilot and has lived in two countries and five states. Every home in which they lived was filled with music as her family sang together to the sound of her father’s guitar or her mother’s piano, or sang in cars, trains, and planes as they moved from base to base. She continues to raise eyebrows at stop lights as she carries on the family tradition of singing in her car. In 2003, Carey returned to the studio to begin recording her second CD, a collection of her own songs as well as songs by John Prine, Jennifer Stills, David Crosby & Jeff Pevar, and Roger Henderson. However, Carey had to step away from both the CD and her music that same year to tend to her family, only performing on a limited basis. In 2008, she began performing again and returned to the studio to finalize the CD. Plans came to a halt when her father fell ill and she once again stepped away from music to care for her parents until their deaths in 2009 and 2011. In a strange twist of fate, after her father’s death Carey’s will to write or to perform music simply and inexplicably vanished. It wasn’t until 2010, when friend and musician Eric Lowen - himself struggling with ALS - encouraged her to play that she picked up her guitar again, but her will was still not there. Not long after her mother died in 2011, Carey’s former singing partner, Roger Henderson, also passed away. It was at his funeral that Carey sang again for the first time in almost two years. Her return to the stage came at a Memorial Concert for Henderson, two years to the day since she had last performed on stage. It continues to stun her that one death took her music from her and that another brought it back home. In 2012, Carey began writing again and now plays a limited number of live performances per year. 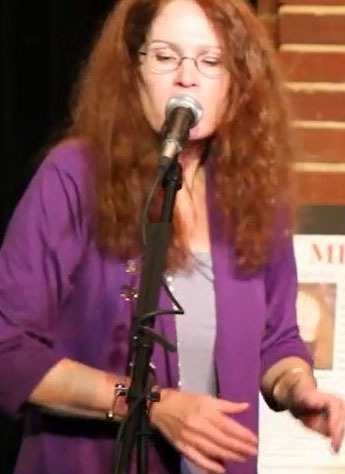 In October of 2012, Carey was honored when her recording of Crosby and Pevar’s song, Little Blind Fish (featuring Pevar on guitars and mandolin), was chosen to be included on a Special 5-Song Companion CD, only available with the purchase of the Limited Edition release of Music Is Love - A Singer Songwriters’ Tribute to the Music of Crosby, Stills, Nash & Young from Italy’s Route 61 Music. The Tribute CD features such artists as Jennifer Stills, Judy Collins, Marcus Eaton, and Venice. Carey–a lover of harmony–performs in a duo format with her husband and music partner Granger Helvey, a noted musician in his own right. She is also available in a solo or full band format. Web site and contents ©1998-2019 Carey Colvin / Raspberry Sun Music®. All rights reserved.